...is what my ex boyfriend used to say to me... referring to how I got sucked into clever (or even not-so) marketing. He was right though, and looks like I'm about to fall victim to myself yet again it would seem! 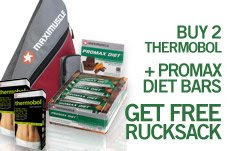 On the maximuslce 'maxiwomen' website, they have a new promotion where you buy 2 bottles of their 'Thermobol' fat burning pill, and a box of Promax Diet Bars and you get a free maximuscle bag, worth a staggering £14.99! ha! anyone who knows me, also knows that I don't need any more bags, ever ever ever! however, I'll probably buy this anyway as I'm keen to try out the Thermobol pills and I could do with a new rucksack for the gym... even though I know I don't need one! I am a sucker for those kind of promotions too. The saying goes, "A bargain is something you don't need at a price you can't refuse." ha! yeah, that's about as accurate as you can get! definitely didn't need it, definitely can't refuse! !